The program presented before mass about cereal grain and agriculture production in Poland was very well received and educational. The participants from Texas enjoyed the topics presented and more importantly enjoyed the information about wheat and the recipes. In addition, the bread table at the reception was most educational to the Polish Texans because most of them had never experienced such variety and quality of breads. This was an outstanding educational experience for everyone in attendance. Also, each program presenter did an outstanding job of presenting their information and I personally know that Jennifer Yezak from the United States Department of Agriculture in Washington D.C. benefited from this program as well as everyone else. 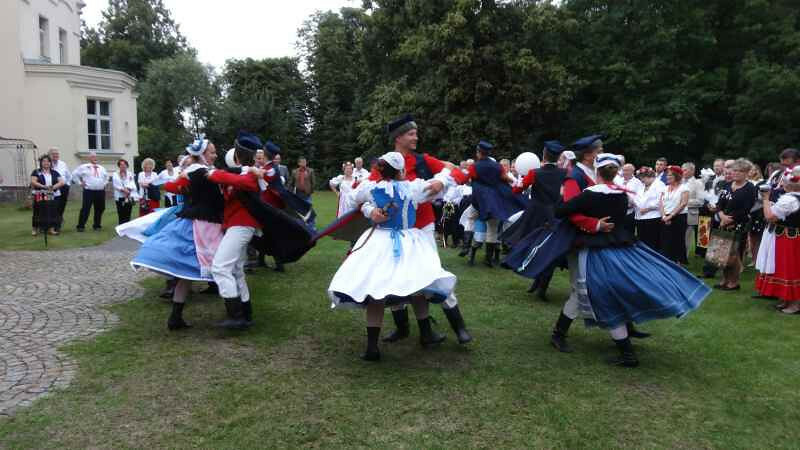 The Folk Song and Dance Group “Wiwaty” was outstanding and no doubt one of the best Folk Song and Dance Groups in Poland. The song and music performed during mass was very beautiful and emotional. It was very difficult for me to believe that my family and I were actually in the church of the Mazurkiewicz family and that my great grandparents were married and stood before God in this church 128 years ago. The beauty of the church decorated with the flowers of summer and the folk choir singing so majestically was one of the most emotional times in my life. I could feel the presence of my great grandparents on this day and I believe that they were smiling down from heaven with joy and jubilee to see this holy day. The homily given by the parish priest was one of the best I have had the privilege of hearing and it was very moving to hear it in Polish and then in English concerning our roots and history. His message was eloquently delivered and most appropriate for the occasion. In addition, each of the people reading during mass did an excellent job and it was very nice to see the spouses of my friends participating in the ceremony during mass. The organization of the folk singers, the musicians, the costumes, the flowers and the traditions & music during and after mass was spectacular and I do not believe there was a dry eye in church during the entire holy mass. Photos can hardly describe the beauty and pageantry of the entire celebration, but the USA, Texas and Poland flags were very symbolic in displaying our cooperation and unity outside of the church. In addition, the horses and wagons were fun and enjoyable. Kathy wanted to have this at our wedding 35 years ago and she received her wish 35 years later thanks to each of you! 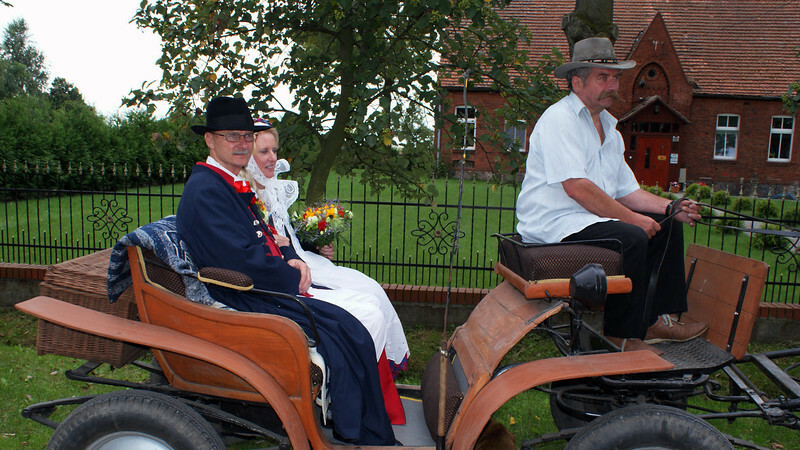 Also, the brama was most special with the children of the village participating and one they will not forget as they saw the pride of the American Polish descendants riding through the countryside in Wielkopolska Folk Costumes. After arriving at the palace, the greetings by everyone and the folk dancers and musicians were like participating in a Hollywood movie or a special dream! Receiving the bread and salt on the steps of the palace by key members of the Sejm was very humbling and then looking over the crowd that had assembled was undeniably unbelievable. 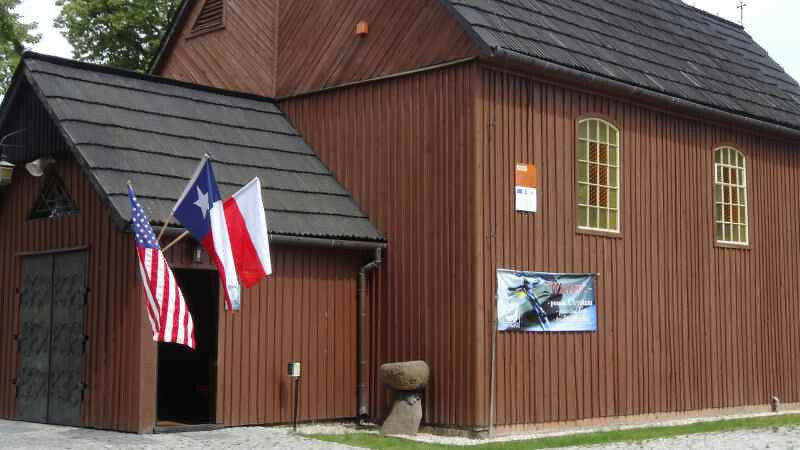 This was a celebration to remember and the Polish Texans in attendance were much honored to be a witness to this great day. The hall for the celebration was beautiful and the tables were eloquently decorated to perfection! The meal was delicious and the table displays of bread, cakes, sausages and meat were fantastic. The display of wheat and breads was one of the most professional displays I have seen and this was one of the biggest educational moments for the people from Texas. They had never tasted such outstanding and different breads and were very excited to have had this educational experience. Late that night, the final meal of roasted boar was unbelievably the best pork we have ever tasted! It was very good and delicious! One of my most memorable moments was when Marian stopped the band and brought me my concertina and asked me to play “Siwi Kon”! I could hardly control the tears of joy because I knew that most of the members of the National Association of Cereal Producers Association that came to Texas were present that night. Also, this was special because this was the first time this song had been played by a relative of my family on this soil since 1885. As you can see, we have made a full circle and we need to continue to work together to promote solidarity and provide educational opportunities for both Poland and Texas. As a result, we already have created a new generation of friendship between our children and contacts on both sides that will last for generations to come. We would be remiss if we did not mention the many gifts and gestures of love and congratulations from everyone in attendance. As I have said many times, we may have lost contact with my family since our immigration, but I have gained a new and even larger family through each of these people. The green woven rug with the tree bridging the people of Poland and Texas is a special gift that will be displayed in a prominent place in our home for everyone to see and admire. My parents were in tears when they saw the photos of the wedding because my father remembers his grandfather discussing the difficulties of leaving family and friends behind with little or no communication during the partitioning period, two World Wars and communism. 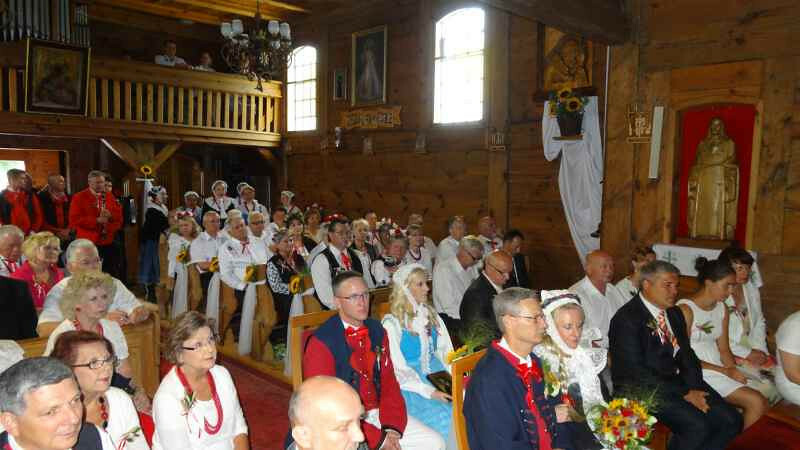 They were proud to see the wedding anniversary celebration of their son Jim, the great grandson of Lorenz Mazurkiewicz, celebrated in the same church as the wedding of his great grandfather. The symbolism of reuniting Poland with their children around the world is significant in healing the pain of the past. The door between our two countries has been closed for too long and it is now our duty to support and continue cooperation and communication between current and future generations. Our progress in working together is only limited by our creativity and vision and by working together we can accomplish many goals. You have my promise to continue to build solidarity between Texas and Poland to learn more about history, the promotion of national culture and the development of educational exchange for future generations. This occasion was so spectacular and heartfelt knowing that we were surrounded by love, happiness and solidarity embracing our common Polish heritage. As it was said that day, Roses are beautiful when they are in bloom, but they eventually fade and die, but let your love grow and it will never fade away and it will last forever. Thank you for wishing my family and me the best. Your quote of “holding tight hands always smiling together, always sure of your feelings and sharing your life with others” will be one we will be reminded of each time we think of this celebration. We promise to let our problems pass us by and we will keep joy and happiness forever in our hearts always remembering our friends in Poland on this special day. We thank God for this special relationship that has developed and we are fortunate to be surrounded by people such as you with such warm hearts, love, security and happiness. Once again, my family and I would like to express our most sincere appreciation to everyone involved in making our 35th wedding anniversary celebration a success and a dream come true. You have honored my family and me with the ultimate gift of love and treasured memories. We will forever be grateful to each of you for making this day so special. The gift of life is meant to be enjoyed and shared with God’s greatest treasures – faith, family and friends. God bless each of you and thank you! Serdecznie pozdrawiam. Niech Bog ma Ciebie i Twoj1! rodziny w swojej opiece. Z serdecznym uznaniem. 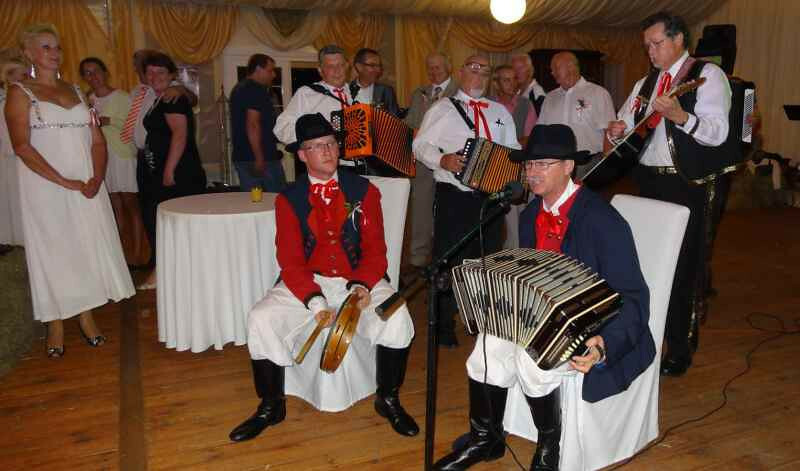 Below are a few photos of the celebration and there is a slideshow of more photos on page 2 ( all photos courtesy of Tadeusz Szymańczak). There are a few videos in the Polish Texans Video section.